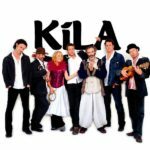 Kíla are an Irish folk music/world music group, originally formed in 1987 in the Irish language secondary school Coláiste Eoin in County Dublin. Cé Tú Féin? Who Are You?